Slowing purchases of cattle and increased supply of feeder cattle weigh on feeder cattle price. Will the FCATTLE continue declining? The feeder cattle price had been falling in the last couple of days as farmers slowed purchasing of cattle while profit margins for fattening cattle declined. And from the supply side the US Department of Agriculture reported increased imports of Mexican feeder cattle into the southern United States. Higher supply and lower demand are bearish for feeder cattle. On the other hand the US Department of Agriculture releases the current WASDE report due today at 16:00 CET which may constitute and upside risk for price with fresh data. 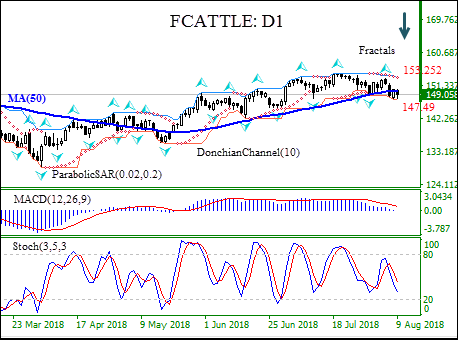 On the daily timeframe the FCATTLE: D1 has breached below the 50-day moving average MA(50) which has leveled off, this is bearish. The Parabolic indicator gives a sell signal. The Donchian channel indicates downtrend: it is tilted lower. The Stochastic oscillator isfalling but has not reached the oversold zone. We believe the bearish momentum will continue after the price breaches below the lower boundary of Donchian channel at 147.4900. This level can be used as an entry point for placing a pending order to sell. The stop loss can be placed above the upper Donchian boundary at 153.2620. After placing the order, the stop loss is to be moved every day to the next fractal high, following Parabolic signals. Thus, we are changing the probable profit/loss ratio to the breakeven point. If the price meets the stop loss level (153.2520) without reaching the order (147.4900), we recommend cancelling the order: the market has undergone internal changes which were not taken into account.